I played all of these, I think my favorite is Frogger 2 because of the music in the 2nd screen, and using cutscene screens in the background. thanks for checking them all out! I've also become very attached to all the different klipart, each one has a kind of history in my mind based on how I've used them and how I've seen other people use them. it's like some kind of communal characterization, where we all come together to decide what each sprite and backdrop *means*. after realizing and typing that I feel like my appreciation for GT has increased! I enjoyed all the games. I enjoyed all the games. It's fun to watch them like screen savers. There's something mesmerizing about just watching these things. The shy 80 game was fun to watch, and the music made me want to sit there watching the characters float past. same kind of thing with the recycling game. The frogger game may have been most annoying to play but still was surprisingly enjoyable hahahaha. Thanks for the games. 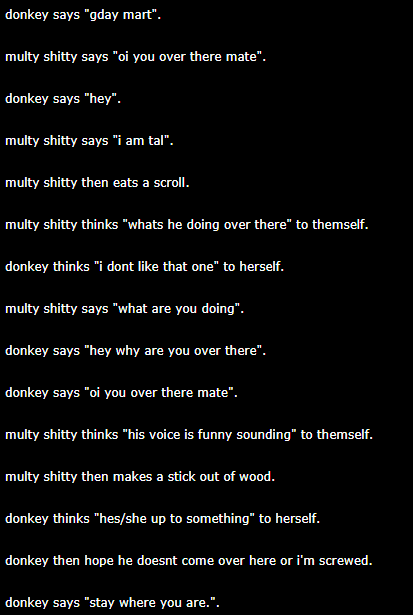 I created a nice story in A Conversation, I hope you like it. I was thinking about screensavers while making some of them! I kind of want to try starting with that intent some time. I remember fondly the 3D maze screensavers I saw growing up. I think there's something fascinating about a game that doesn't take input, but still puts on a performance. on the one hand it feels like such a thing would be quickly denounced as a "non-game" in a negative way (not by people who are already here, of course), but I like to question the role of player agency and I think it's valuable to explore. I barely changed the frogger physics from the default settings because I found it to be at a great ratio of funny/antagonizing. it feels good to have finally made one of those infamous trainwreck platformers! and your welcome for the games, I'm glad you enjoyed them. I like your story, thanks for sharing it! Thanks for playing! I don't have easy access to testing things on a mac, unfortunately... I really should be doing more testing in WINE on at least Linux! You Can Only Shy 80 Times is my personal favourite, and yes I love the screen saver feeling. I want to pursue that further some time. I'm glad you liked A Conversation so much, I've been worried it might seem cheap to some people. And I'm also glad to help inspire your own game development!